Do you need new slippers or sandals? Maybe you want to give a new colourful and fashionable look to the old ones? It is high time to find out how to make slippers with Ankara. Ankara fabric is cotton with vibrant patterns. The patterns are colourful with tribal-like motives. Today you can find Ankara prints on any kind of fabrics and clothes. The original print is made with wax-resist dyeing technique. Today we are going to talk about slippers with Ankara fabric. Follow the tutorial and enjoy your new unique pair slippers. What do you need for African slippers with Ankara? You do not need any special knowledge or experience to make such slippers. 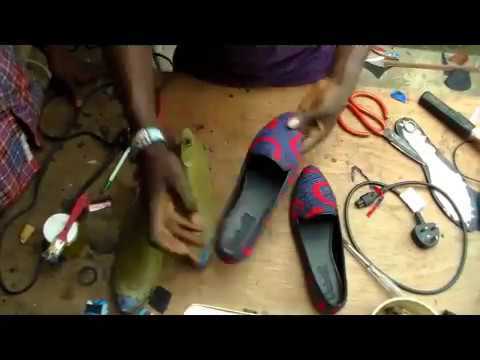 You will not do these slippers from scratch so there is no need for any shoemaking skills. A pair of slippers (it can be new or old slippers);The desired length and design of Ankara fabric;Scissors and fabric glue (but do not use superglue! );Alcohol wipes or their substitute;You can also use hairdryer, to make it faster. Assess the structure and size of the slippers you are going to give an upgrade. Cut the Ankara fabric to the required size and amount of pieces. The size of fabric should be bigger than the part of slippers that you will cover. The size of fabric pieces should be enough to cover inside and outside of the part that goes over your foot. With alcohol, wipes wipe the surfaces for gluing the fabric. Don't skip this step otherwise fabric might not stick well;Without adding the glue arrange the pieces of fabric on the slippers, do this just to make sure that everything is okay with the size and symmetry;It is time to apply a glue to the slippers. Arrange the fabric on the glue and gently smooth out any wrinkles;Check the symmetry of the patterns, before the glue is stiffened;Be sure that all the fabric is glued to the slippers;After gluing, dry the slippers with hairdryer, or wait for few hours;When the glue is completely dry, your Ankara slippers are ready to go! Ankara slippers designs can be very varied and it is hard to choose the best one. So, to solve this issue we have prepared for you some designs for inspiration. Actually, you can just decorate the slippers with Ankara fabric flowers, and it is done! Your old slippers gained a new look! For those who like light variation, it is quite a good idea to use minimum details, and do not burden the feet. Find your unique print, pick up colours and compose them with bows. As you see it is very easy to make such slippers, if old design bores you, it is not a problem to change the fabric to a new one. So do not waste time and get down to the design.